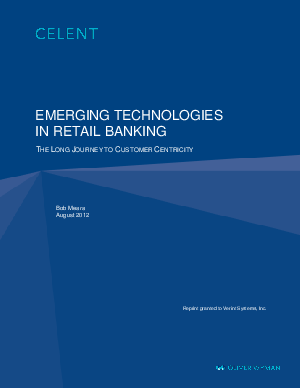 > Verint > Emerging Technologies in Retail Banking: The Long Journey to Customer Centricity. This report updates and expands upon a previous report, Branch Banking in a Multichannel World: What Ever Happened to the Branch of the Future? August 2010. The report draws upon multiple interviews among financial institutions (FIs) and solution providers as well as a survey administered among 132 North American FIs during May/June 2012. The previous research, conducted in July 2010, found that despite the rapidly growing popularity of self-service channels, the branch network constituted FIs’ highest channel priority among a growing array of alternatives. Financial institutions had been investing in the branch channel, but the changes were baby steps toward a more substantial transformation. The 2012 survey suggests that the branch of the future may finally be in sight. More significantly, the survey reveals that for a growing number of FIs, the long journey towards customer centricity has begun. Perhaps the only thing more depressing than the current retail banking business and regulatory climate is the prodigious effort needed to equip retail financial institutions to thrive in our increasingly multichannel world. A significant majority of FIs are ill prepared for what is upon them. A minority has begun a complex journey, but has a long way to go. No one has arrived. But, in Celent’s view, the events of the past several years have pushed a number of FIs past a tipping point, leading to significant, measurable changes in attitudes, organization, and technology deployments since our last survey in June 2010.